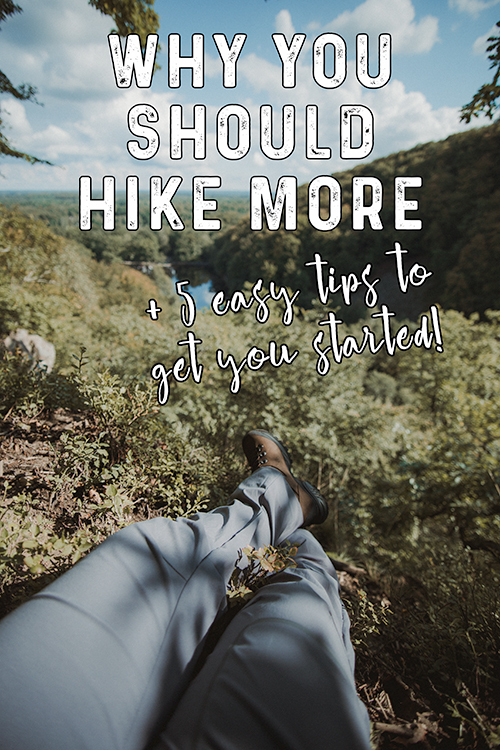 Why you should hike more + 5 easy tips to get you started! Hiking is a favorite of mine and I do it a lot. And now I'm going to try to get you interested as well haha! I love hiking just because of the simplicity, you can hike almost anywhere, you get to be out in nature and it's just very simple! It also just happens to be the only kind of exercise/cardio that I don't hate, so that's very helpful. So why should you hike more? Well, it's not only a great form of exercise but every hike is a new adventure. On every hike you discover something new and that's something I really like. I always hike without headphones or any other distraction which is just so much nicer than listening to some boring pop-song and not listening to the wonderful sounds of nature. Wow, writing that I realised what a nerd I am haha. Hiking is also super cheap and more than often FREE! A free adventure?! Who would say no to that?! So while you are saving up for those other amazing adventures you can still explore and discover via hiking. Also, you don't really need anything but a good pair of boots and clothes to fit the weather and you're good to go! When I was younger I didn't really understand the point of hiking but the older I got I realised that it's very relaxing and as a student I can really benefit from that. Between stressing over exams and going to lectures I try to squeeze a hike in to get my mind off things and you should too! To help you get started with hiking I hereby present to you 5 easy tips to start hiking! 1. Invest in a good pair of boots! Although hiking isn't about the gear, you will benefit from a good pair of boots and they will probably last you a long time if you take good care of them. I use the Hanwag Tatra Lady GTX and I'm very satisfied since they are not only warm but also water proof. 2. Bring a friend! It's easier to get started if you bring a friend also if you plan to hike together it's harder to bail on eachother since no one wants to be that friend. 3. Dress for success! I learned this the hard way, look at the weather forecast BEFORE going on your hike or you might end up very cold or even worse in my opinion very hot. Also bring a rain jacket no matter the forecast, because you never know. 4. Bring water and snacks! Hiking can be tougher than you think so bring water and snacks to be able to make it all the way. Hiking is no fun if you have low blood sugar, let's just leave it at that. 5. Let other people know your hiking! If you are hiking in a remote area please inform a friend or family member three things; where you plan to hike, who you are with and how long you are planning to hike for (if it's a hike during several days). It's better to be safe than sorry in case of an emergency!